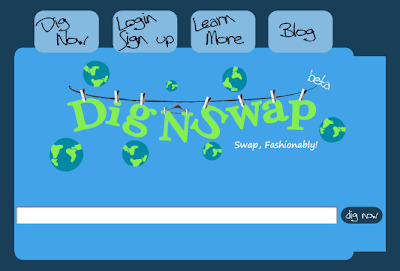 I recently found a new website called Dig 'N' Swap where you can swap your used clothing and accessories for something different. You can create an account, upload pictures of what you'd like to swap, specify what you're willing to swap it for, and look for possible swaps. You can search by type, brand or keyword. When you find something you like you can place a bid. You can bid one item or several items. If your bid is accept, you have a swap. Swapping is free too. The instructions are here. You can read more on the blog here. The sites still looks fairly new, but there are some good finds if you dig around for a while. This might be the perfect place to swap your old prom dress for a more practical LBD or get rid of that collection of cute but cheap purses for one nice bag. It may take a little time to find and make good swaps, but it's a nice, free way to update your wardrobe.